In March 2017, the Whitman Hanson community lost Lori Sawtelle after her courageous battle with colon cancer. Those who knew Lori will remember her devotion to her family as well as to her community. She is greatly missed every day and never far from our thoughts. Lori was a devoted mom to WH Boy’s hockey Captain Ryan, his sister Ashley and the beloved wife of Scott. The WH boy’s hockey team will be honoring Lori in many ways this season. They are all wearing Lori’s initials on their jerseys as a tribute to Lori’s courage and kindness. The boys will also be wearing a brand new third jersey on special nights and for big games. These jerseys were an idea from assistant captains, Korey Howard and Alex Uva, as another way to remember Lori and for the team to show support to their captain Ryan and the Sawtelle family. On Saturday January 6th @ 8:00 pm at Rockland Rink, the WH boy's hockey team will be hosting "Lori Sawtelle night”. The team will be wearing their new 3rd jerseys in her honor. Donations will be collected before and during the game in Lori's name for the American Cancer Society. Let’s pack Rockland Rink on Saturday night in remembrance of Lori and in support of Ryan, Ashley and Scott. Kids that wear black and red will get in to the game for free. We will be doing individual player pictures, warm-up suit sizing and apparel package ordering on Monday 12/4 @ 6:00 pm at Meadow Brook in Hanson. This will be the only day that we will be doing individual pictures and the only chance to order the warm-ups and apparel package. We will be starting around 6:00 pm for pictures and will be there from 6 - 8 taking orders. 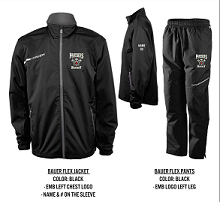 We will have sample sizes of the warm-ups and apparel for the players to try on. For individual pictures the players should wear a white shirt and the team tie that was used last year. If you do not have the team tie, we will rotate some through once those players have their pictures done. We are assuming everyone will have their jersey by Monday . Please bring your jersey with you - Red for Varsity, Black for JV. We talked about the warm-ups that we would be offering for all players (Varsity and JV) at the last parent meeting. Monday is the only chance to order these warm-ups. If for some reason you cannot make it, please email your size by Monday night. The order has to go in on Tuesday. If we don't get your details by Monday night we won't be able to get your warm-up ordered. We will have an apparel package available for sale, as well. This will included a WH Hockey sweatshirt, t shirt and shorts for $75. Best time of year...It's hockey season. Good Luck to the boys at tryouts! Looking forward to a great season for the Panthers. 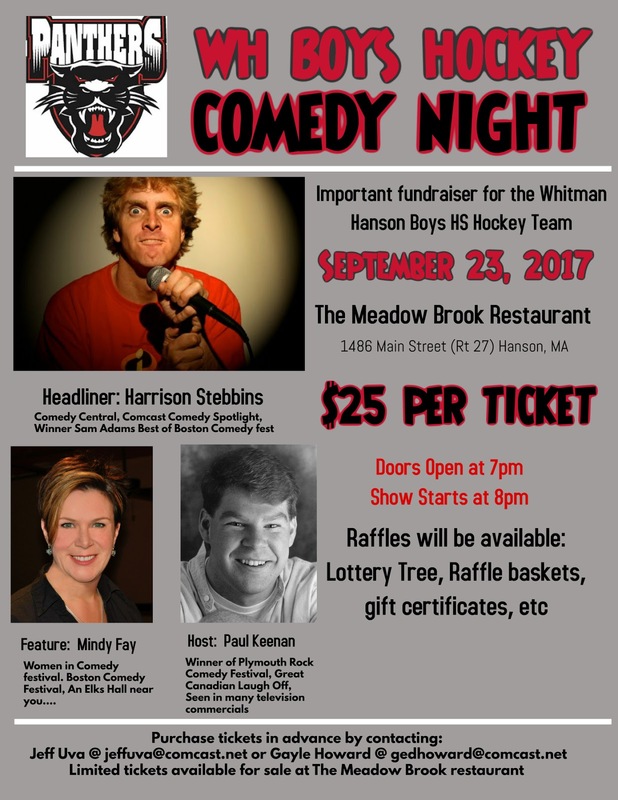 Thanks to everyone who purchased tickets, donated items and especially donated their time to help out with the comedy night fundraiser. I know there is a common theme among the parents - anything that can be done to help the boys, is worth the effort. It was a great night out for those who could attend. WH Boys Hockey comedy night will be at Meadow Brook Restaurant on 9/23/17. Please buy tickets early - more details to follow. Last year was a great time and a big success. We can only repeat that success if we get family and friends to buy tickets early and enjoy a great night out. 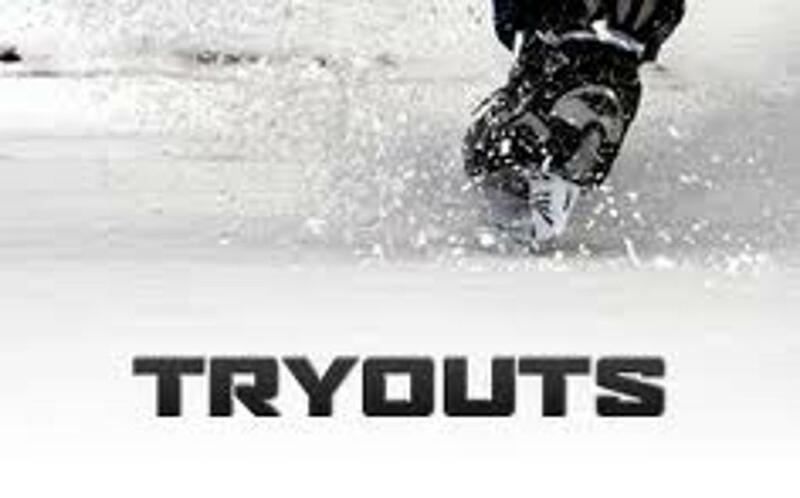 There is a hockey meeting next Wednesday at WH @ 2 - bring check for $110 made payable to Rockland rink if you are going to participate. Anyone who still has not received their sweatshirt can pick it up in Mr. Rodger's office. Here are links to the slide show created by Kassie Howard & the highlight video created by Rui Carreiro and Jeff Uva. Thank you all so much for taking time out of your busy lives to make sure the kids on these hockey teams have something so great to take away from this hockey season and have forever! Congratulations to the following award winners announced at the WH Hockey Banquet!! Like WH Hockey on Facebook! Click here to visit the Whitman-Hanson hockey photo galleries.